Fig. 1. Left: the location of Summanen impact crater in Finland among the other eleven impact structures. Right: The coastline of Lake Summanen is shown in red. The topographic heights and the lake depths are shown as reliefs: brown depicts topographic hills, green flat terrane and blue deep water, respectively. The crater itself is estimated as broken yellow contour. The impacted rocks have been found in the mainland, towards SE from the centre of the impact. Credit: Left side by Jüri Plado; Right side original data modified by JP. A Finnish-Estonian scientific collaboration by Geological Survey of Finland, University of Tartu, and University of Helsinki has led to a discovery of ancient meteorite impact crater in Central Finland. The crater has a diameter of 2.6 km and it is covered by the Lake Summasjärvi (Summanen), about 9 km south-east of the nearest city, Saarijärvi, and 275 km north of Helsinki. The age of the impact event and the type of the meteorite causing the crater, are still unknown. The discovery is based on earlier geophysical studies of the area by Geological Survey of Finland. As a consequence of the field trip conducted by the Finnish-Estonian research team in 2017, proofs of an ancient asteroidal shock were obtained. The Summanen geophysical feature was first identified in the early 2000's by Jouko Vanne, a geologist at the Geological Survey of Finland. The observation was based on low altitude aeroelectromagnetic data that revealed circular electromagnetic apparent resistivity anomaly associated with Lake Summanen. The meteorite impact theory got a further kick in summer of 2017, when the Finnish-Estonian team found inevitable evidences of traces of a meteorite hit. In particular, shatter cones, fractured and brecciated rocks, were discovered in Summanen area. The microscope studies of thin sections of shocked rocks prove the meteorite impact interpretation and reveal huge shock pressures suffered by the local basement rocks. In time of the crater formation, the diameter has been larger compared to the present 2.6 km since the erosion by geological processes, augmented by glaciations, have diminished the original crater size. 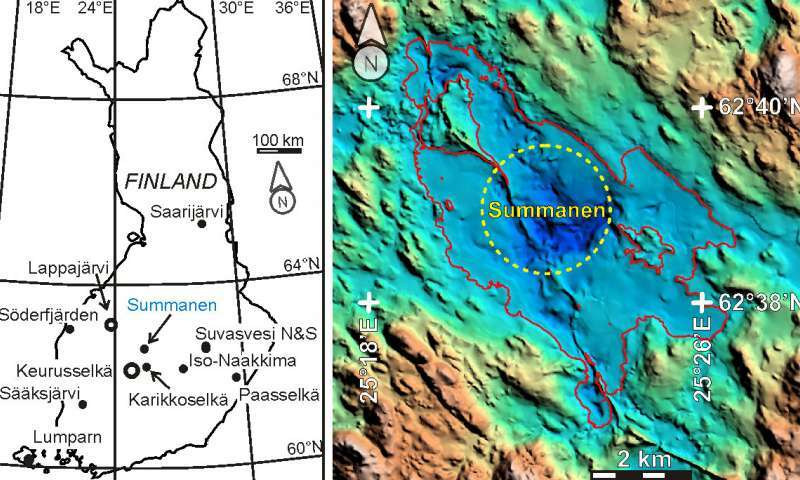 Summanen is 191st confirmed meteorite impact structure on the surface of the Earth. The great majority are found on continental areas with only a few oceanic impacts. Although in global perspective the Summanen belongs to the group of small craters, it, together with the 11 previously proven impact structures in Finland, places Finland into one of the leading countries with impact structures. The largest impact structure in Finland, the Keurusselkä structure located also in Central Finland, has a diameter of >30 km with an age of about 1100 million years. The Summanen explosion has been much smaller, but, nevertheless, produced a big damage in the environment.